In 2017 politicians accuse each other recurrently of using post-truth in favor of their interests, treating their voters as mere puppets incapable to draw logical conclusions from proven facts. But we will not talk about politics, as this blog’s objectives lie far away from such topics. Then, you will probably wonder, how does all this stuff relate to beer? The guys at Damm have always been at the forefront of communication, advertising and marketing. It would be wrong of them to lag behind in embracing new global trends, so they decided that it was a good time to use post-truth in their ads. To do this, they recorded a new short film - which they have the nerve to call 'The Recipe'- with hot, trendy actors in idyllic spots of the Catalan coast; you can watch it below. It is clear that the purpose of the short is to present Estrella Damm with an image of high quality and tradition, with a sophisticated brewing process and cool for the consumer, as usual. Personally, I think it is a rather awkward dialogue, the one the two protagonists have, but beyond my opinions there was something that felt wrong from the very first time I heard it. Not only that, because after a couple of checks it also felt irritating. Flagrantly, and without any hint of decency, Damm lies. One must admit that it is true that not every brewer lets the beer rest 2 weeks after fermentation: in similar beers we could speak of months. We might get thin-skinned in many more ways, but let's not lose the focus, because the interesting point comes when the tall guy, Miki Esparbé, states during his monologue: ‘neither additives, nor preservatives; as it used to be: only with natural ingredients and a recipe with more than 140 years’ [translated from Spanish]. And it is not that the he enters into a frenzy, nor that he is still dizzy as he comments at the beginning of the film. What he says is something that can be found in the brand’s visual advertising, propagated both digitally and physically through all possible channels. Now there is a question for me: what proof do you have that Miki is not right? If we go beyond the absurdity of thinking that a recipe remains unchanged for more than 140 years, considering the changing size and structure of the brewery, the evolution of brewing techniques and the different sources and qualities of the ingredients, there are several items of evidence to be found. Let us begin with the brand’s product presentation over the years, from the moment in which the labelling information requirements were introduced in our jurisdiction*. Many collectors are well aware of the additives announced by Damm in the crown caps of Estrella Damm, as they are one of the distinguishing elements among some items in breweriana catalogs. In this sense, it is good to know that Estrella Damm does not need E-405 and E-223 today. However, I remain doubtful about whether August Kuentzmann or Joseph Damm hit upon introducing such additives back in the 19th century. If two ingredients, a foam stabilizer and an antioxidant, were disregarded, I dare say that even beyond the brewing process the recipe has changed. But it is not necessary to go back to the 80's! 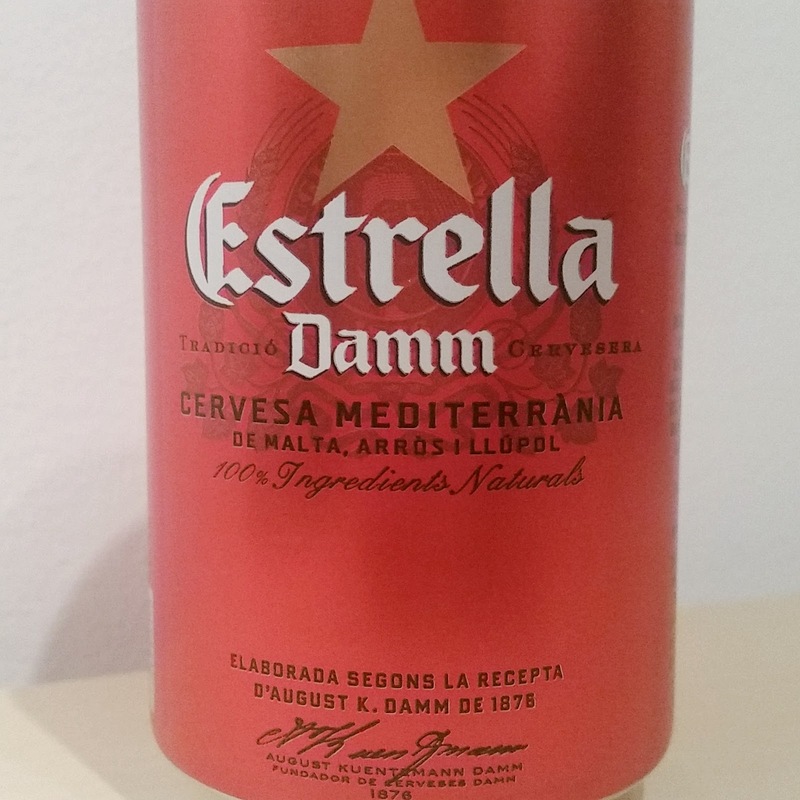 Just 5 years ago, on my visit to the Damm facility in El Prat, I was gifted with a new bottle of Estrella Damm that would be marketed in the UK. The back label clearly indicates that the beer contains maize and E-405 stabiliser -E-223 disappears- in addition to 4.6% ABV. 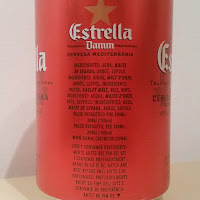 As far as I can verify, Estrella Dorada and Estrella Damm have always had 5.4% ABV. The difference is naturally achieved by adapting the recipe, so that the product graduation adapts better to the drinking habits of the British consumer. 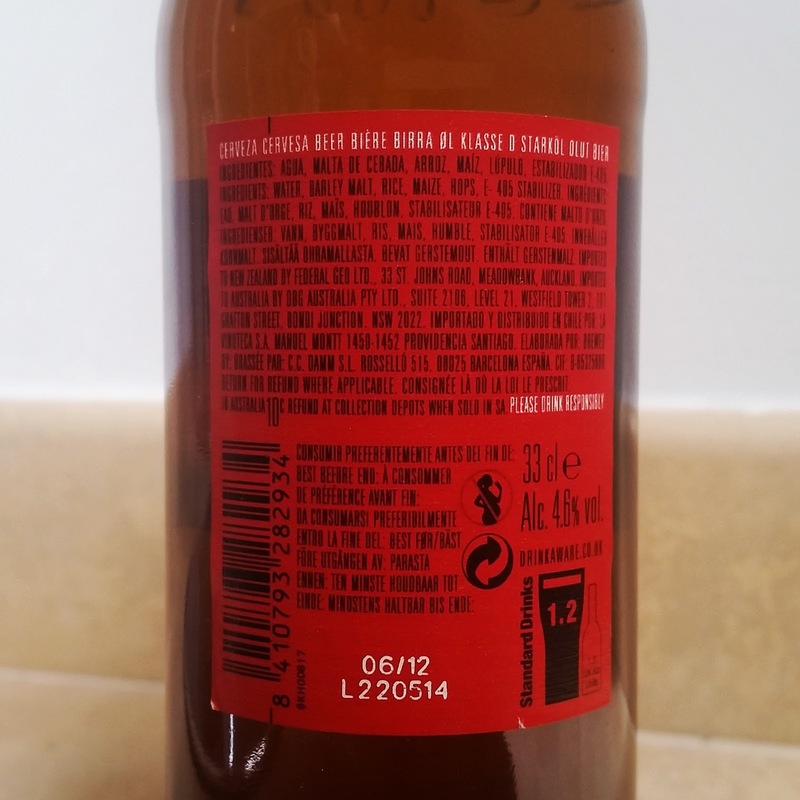 The labelling of Estrella Damm bottles for our local market, until quite recently, also detailed the use of maize and E-405, but with the classic 5.4% ABV. 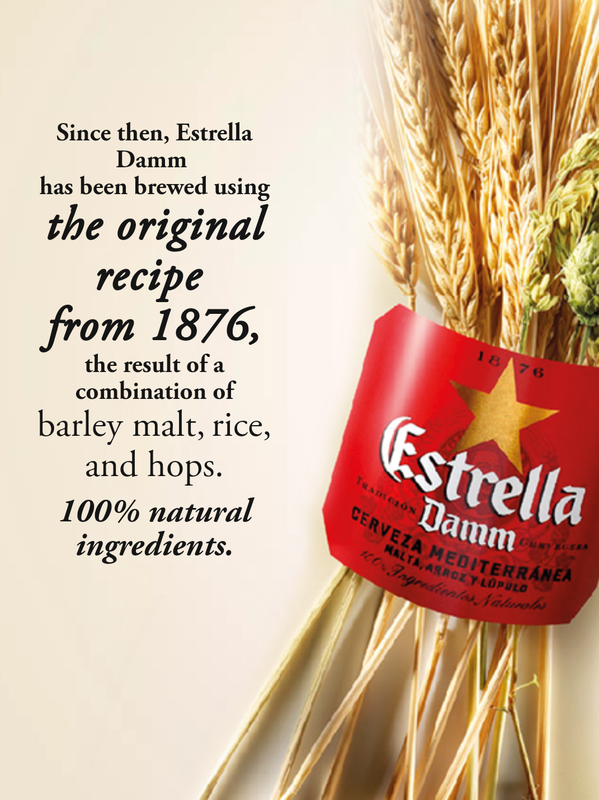 Now, we are told in both Spanish and English that since Damm’s foundation Estrella ‘has been brewed using the original recipe from 1876, the result of a combination of barley malt, rice and hops. 100% natural ingredients'. Still, labels and advertising do not mention ingredients such as maize, stabilisers or antioxidants, which used to be listed. Original recipe from 1876? But please, keep reading because there is further and better stuff to come: even the date (1876) is inconsistent. There is a book** edited by the company itself to celebrate its 125th anniversary, commissioned from the Board of Directors to 'update our history'. 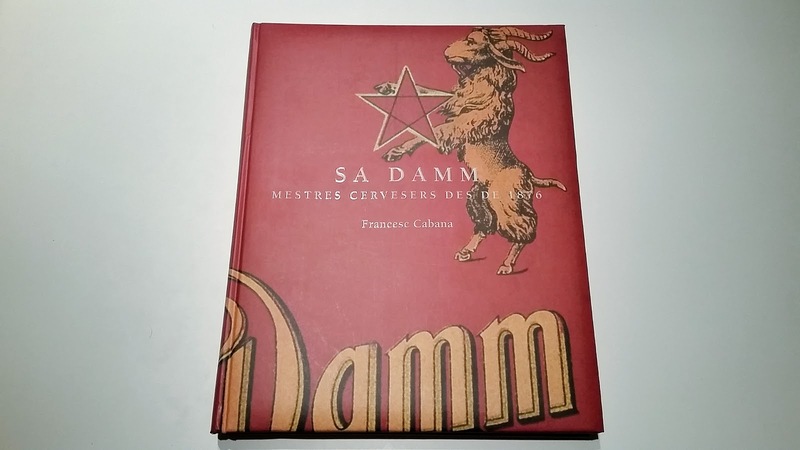 An interesting book, which provides a general overview of the beer industry in Barcelona during the late nineteenth century and the twentieth century. 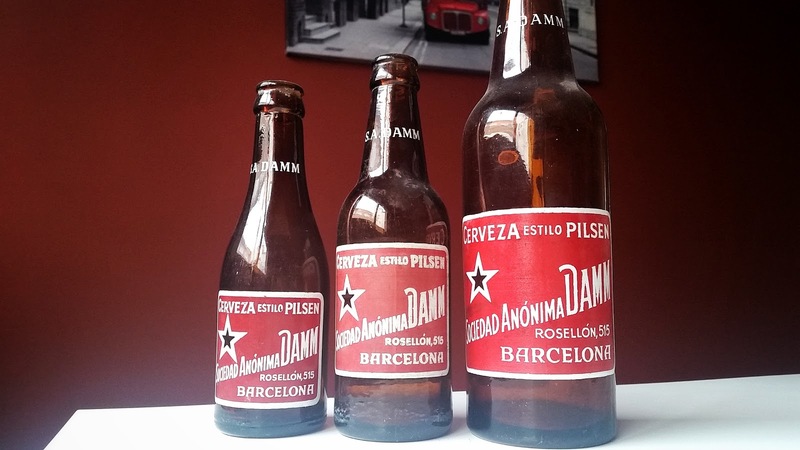 In 1872, August Kuentzmann Damm opened Cambrinus, one of the first beer bars in the city of Barcelona, where he ‘served the first class Strasbourger beer he brewed with Camps’, his partner in ‘Camps y Kuentzmann SRC’. In 1876, date set as start of the activities of the current SA Damm, Kuentzmann set his own business up, with Joseph Damm as master brewer. Strasbourger, Bock and Pilsen were the first beers of the Damm family. 'Pilsen beer, produced by J. Damm since 1897' is said to be still being brewed by SA Damm under the brands Estrella and Xibeca, which are different beers among them. From the above, it is fair to assume that, even if it were the same beer recipe, Strasbourger would be 140 years old, not Pilsen. Also, the recipe was not probably A.K. Damm's, who died in 1877, but J. Damm's. In 1915, the company signs a beer supply contract with Charles Bouvard and Co. (La Moravia). They may have other suppliers, of course, but no order for rice is detailed. 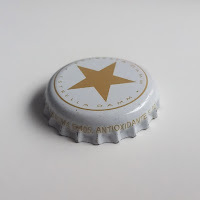 It is not until 1921 that Damm launched its 'Estrella Dorada' -from 1991, Estrella Damm-, which is brewed in parallel to the ordinary 'Pilsen'. In fact, it is noted that ‘in 1935 the beer that sold the most was the ordinary Pilsen (80%), followed by the Estrella Dorada (15%)’. In the Balance Sheet for 1935, the accounting item ‘Raw materials’ refers to barley and malt, although other ingredients are omitted. After the Spanish Civil War (1936-1939), the main problem of the Damm’s administrators is stated as the supply of raw materials, particularly in the case of barley and hops. But, again, no trace of rice, which is not mentioned in any of the nearly 300 pages of the book. Bonus: According to the book, the old bottle in the picture belongs to the time 'when the factory was J. Damm’s' (1897-1907). 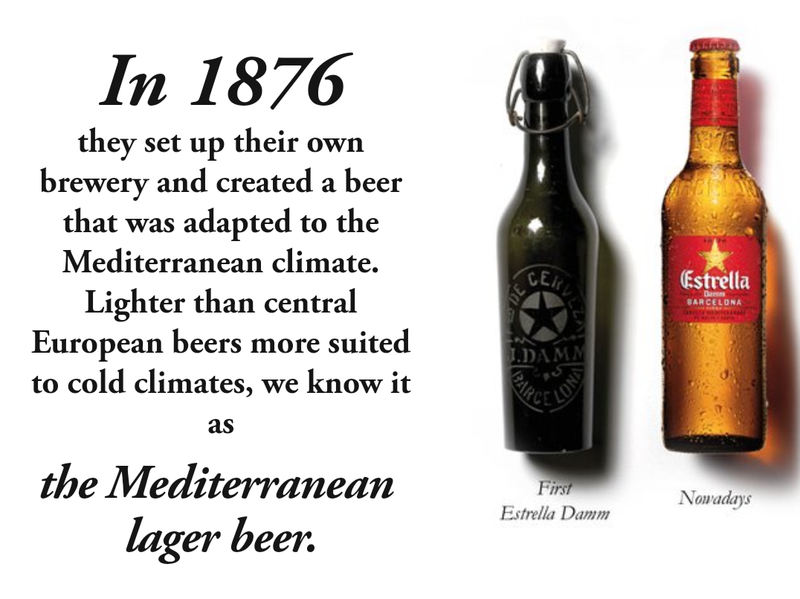 'Estrella Damm' was launched in 1921. Again, those ‘more than 140 years’ are inconsistent. I recommend a careful read of this book, especially if you are part of the Marketing department of Damm. Copies are scarce, but I am sure someone in the company can lend it. I honestly cannot begin to imagine the inconsistencies that would arise if I was to research thoroughly and could check alternative sources to the ones that the company itself has been providing throughout its history. 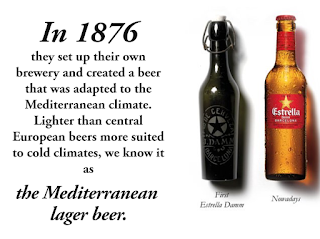 It is difficult to think that the original recipe of Estrella Damm is from 1876. Furthermore, additives such as E-405 and E-223 have been used before. 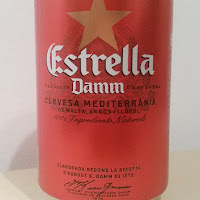 The old bottle in the ads was not an Estrella Damm. The conclusion is clear: it is more important to create an emotion than to tell the truth. 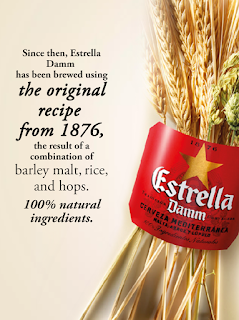 Damm thinks Estrella's consumer will simply stay happy with his beer and, if anything, even more satisfied now that he knows that its ingredients are 100% natural, and that the recipe is almost 150 years old***. Meanwhile, he will overlook the ball passing in-between his legs as the company presents itself as the most authentic, natural and traditional throughout the industry. The key to all this is no longer why Damm resorts to deception, which seems to me to be quite clear at this point, but for how long the consumer will be swallowing this Mediterranean post-truth as he spends his mediocre summer on a sailboat in Formentera. *** Immobility that historically breweries have sold as something good to the general public. This could easily be a topic for another post.